Charlottesville, Va., March 21, 2016 – St. Anne’s-Belfield School hosted more than 2,400 second and third grade students from Charlottesville and Albemarle County today as part of the 2016 Virginia Festival of the Book. 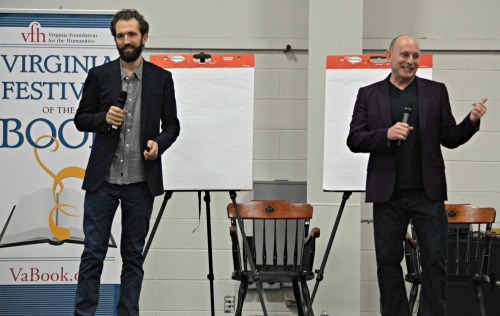 The students split into morning and afternoon sessions to enjoy talks by acclaimed authors Jon Scieszka and Steven Weinberg on the “secrets” of making books, and the sources of each author’s inspiration. They also had the opportunity to create a few characters together, with Weinberg illustrating. “It’s good to be the guy who tells the story or draws the pictures, because then you get to put the story together,” Scieszka told students in the morning session. Named the inaugural National Ambassador for Young People’s Literature in 2008, Scieszka is the author of the New York Times bestselling Frank Einstein series as well as the popular children’s book The Stinky Cheese Man and Other Fairly Stupid Tales, among others. Weinberg, author of Rex Finds an Egg! Egg! Egg! and other books, told the audience that his stories come from his own childhood. Students were invited to suggest ideas for new characters that Weinberg illustrated for them, and Scieszka urged them to create a simple plot as well. “Once you have your character, it kind of helps to have some action that this character is doing. Like, what would the character want?” he asked. The event was live streamed for the benefit of local students unable to attend in person, including children being treated at the University of Virginia Children’s Hospital.